Event Report: Formula D Asia Round 1!! 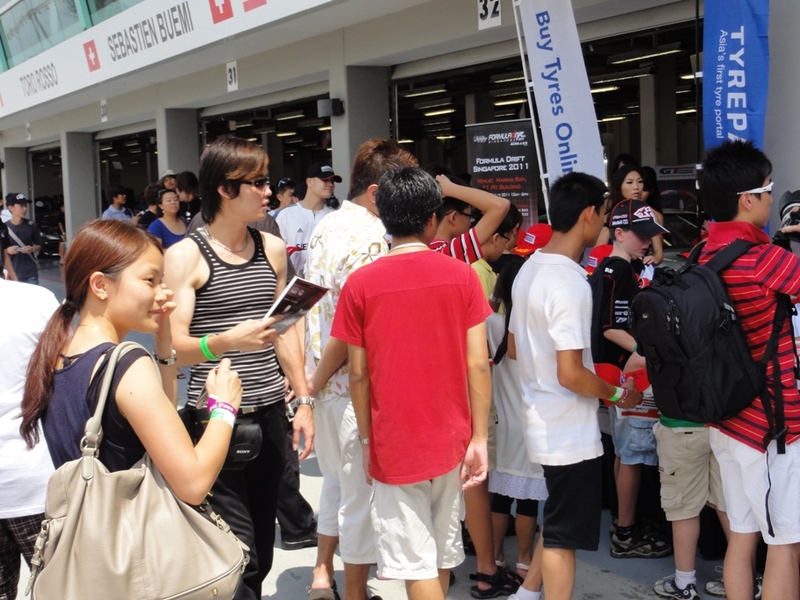 Home » Event Report: Formula D Asia Round 1!! I am proud to tell you I finished in 7th place overall in Round 1 of Formula Drift Asia 2011! It was the most incredible experience, I learnt so much, and have had my eyes opened to a whole new world. The amount of support and appreciation from the masses of spectators, the team and my major sponsor GT Radial has been very special. 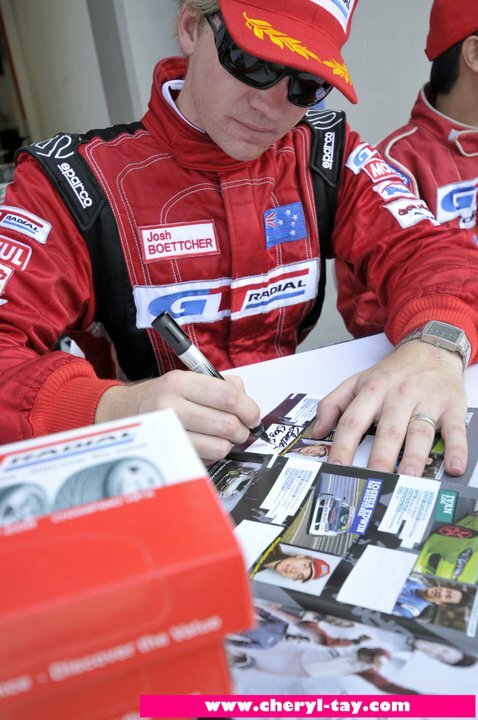 Also thank you to all the fans that wanted my autograph, it was great to have so much support in Singapore! Sunday was incredibly hot and humid. With the rules stating, as they should, that drivers must wear their race suit at all times, the heat and humidity in that suit was hard to take. The goal for the day was to do the best I could. I had told myself that top 16 was a minimum, and after that I should push as far as I could. The battle tree was looking interesting; first up was Charles Ng from Formula Drift USA in the top 32 battle. This was the one I had to win, too many people had put too much time and effort in to see me go out in the top 32. I had put a lot of pressure on myself, and when we lined up to battle I was almost shaking with nerves, but I was still very determined to push hard. I was leading first and I wanted to be clean and fast, so the second run was as easy as possible. The first run went to plan, but the second run I was chasing and Charles threw it in to the first turn with too much angle, and he ended up making a mistake. I was through to the top 16! I had achieved the minimun goal I had set myself, and would now get to be part of the top 16 drivers parade! Th e next battle was up againsst Jo from Thailand. 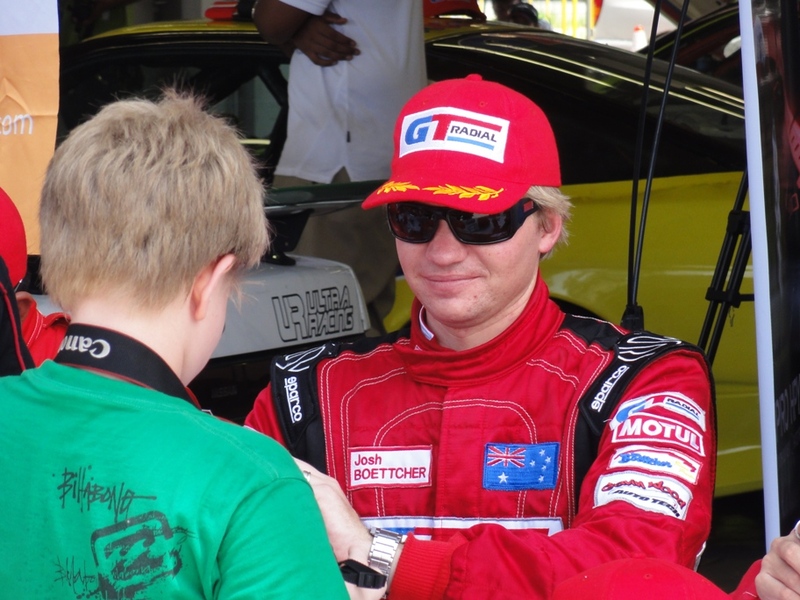 He was known as a very tough competitor after some very good results in last year’s Formula Drift Championship. After some info from my spotter/spotter relayer/mechanic, Gavin Wood, they had worked out his lines and we were ready to battle! I really wanted to get through to the top 8 and battle Ken Gushi. I was confident in the lead up, and pushed the car as hard as I could and was able to maintain a good gap. And on the secnd run, I was able to close on him! Another win, and I was through to the top 8! This was my first time competing overseas, I believe the I am the first Australian in an official Formula Drift Series event and I had made the top 8! With a possible top 4 battle with the big man Daigo Saito, I was really pumped now! Then came time to take on Ken Gushi, a Formula Drift USA veteran, who was driving the Sparks Motorsport, ex-2009 WEDS 600rwhp D1 JZX100! Earlier, I had taken out Charles Ng, one of the 4 big name drivers that Sparks Motorsport had brought to the event. I was hoping to do it again with Ken, I was first to chase this time. I knew this wouldn’t be an easy battle, and took off as fast as I could, but Ken was quite slow off the line. As we entered the first corner he only just got ahead of me and was slow through the first corner, I had to adjust my line a lot, and that was the difference in the end. I was able to run a nice clean, fast line on the lead run but he was able to stay close and took the win. Thanks yet again to the amazingly helpful team at GT Radial! I must mention a few names; Geena, without you I may never have left the start line! Adrian, it’s your efforts that meant I was able to compete here, and your enthusiasm for the sport and us drivers is really encouraging. Leo and TK, for your kindness in showing me through this amazing city! Also Jason Tan for showing us some true local culture! And Ivan for your help and support during the event. They really did everything they possibly could to help all weekend, this has been the most incredible experience, and I look forward to working with you all in the future!! And I cannot forget to mention Mr Gavin Wood! He made the trek with me from Australia, and was there every step, doing everything he could to make sure the car was right for the next run, the car ran like a dream thanks to him. He was in my ear to keep me informed on whatever he could while I was on track, and put up with some crazy weather the whole time! Anyway, I will be leaving Singapore tonight, but will have more pictures and stories from the trip over the next week or so. Also, stay tuned for more info future exciting events with the GT Radial Drift Team! !